A bio-play about Arturo Toscanini is drowned out by its own music. Cameron Kelsall reviews. Any hybrid work runs the risk that one element will far outshine the others. In Maestro, the latest offering from Ensemble for the Romantic Century, music overwhelms drama, creating an unbalanced evening. The title of the play – written by company founder Eve Wolf – refers to Arturo Toscanini, who loomed larger than almost anyone on the classical music scene during the first half of the twentieth century. His life contained plenty of material for a compelling biographical work: child prodigy status, a conducting debut at nineteen, fame in America as leader of the NBC Symphony Orchestra, and a move from Fascist sympathizer to full-throated champion of democracy. Maestro begins in 1938, with Toscanini newly exiled in New York, and spans the length of World War II, when he became a cultural phenomenon in his uncomfortably adopted country. Although Wolf cites Harvey Sachs’s authoritative series of biographies, critical studies, and edited letters as source material, her Toscanini seems more invention than reality. She presents him as frail and doddering as he conducts a studio recording of Aida with the NBC Orchestra, when in reality he would continue living and working at a high level for nearly twenty years after the events depicted. Although Aida (an opera of displacement, political upheaval, and abject despair) makes a poetic frame, Wolf fails to capitalize on the similarities between its themes and the conductor’s own life. The play also chooses to ignore Toscanini’s early flirtations with Fascism, including his parliamentary candidacy under the party’s banner in 1919. Characterizing him instead as a white-knight crusader for social justice creates a hagiographic portrait that’s both less interesting and less accurate. Political alliances, especially among public figures living under oppressive regimes, grow and evolve; Toscanini’s renunciation of Mussolini would still be poignant in the context of his prior embrace of an authoritarian Italy. Its excision suggests that Wolf doesn’t entirely trust her own material. John Noble gives a baffling performance in the title role. Fitted with a starchy white wig and a glued-on mustache, he more closely resembles Mark Twain than the maestro, who remained darkly handsome well into his later years. 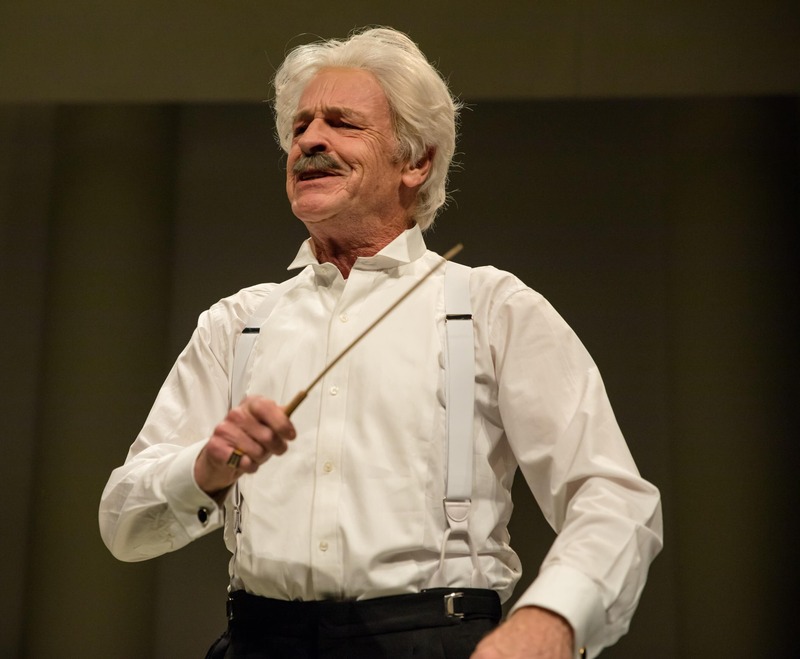 I don’t expect an actor not trained in music to approximate conducting with the same level of expertise as a professional, but Noble’s manic arm-waving looks like the exact kind of flashy leadership that Toscanini mocks. He shows no visible understanding of how to beat time – a problem when playing one of the most exacting conductors in history. Director Donald T. Sanders keeps Noble pacing a small stretch of the stage at the Duke on 42nd Street, which has been fitted with a snazzy Deco set (designed by Vanessa James, who also did the appealing period costumes) that goes largely unused. He tends to leave the stage for long stretches when the action turns to live music, without explanation. That makes no sense. Toscanini’s life was music, so to hardly see him interact with it leaves a large hole in our psychological understanding of him. Ironically, the endeavor only comes alive in the hands of the musicians who supplement the performance. Zhenni Li’s rendition of Wagner’s “Liebestod,” in Liszt’s piano transcription, contains more passion and drama than anything in the play’s underdeveloped romantic subplot, about Toscanini’s affair with the younger, married pianist Ada Colleone Mainardi. Likewise, when trumpeter Maximilian Morel performs his own arrangement of “Rhapsody in Blue,” it says more about life in New York in the 1930s than what’s to be found in the text. Never mind that Toscanini brings up Benny Goodman in passing for no other reason than to introduce this extended solo – it’s worth it. When the musicians take center stage – in addition to Li and Morel, they include a quartet comprised of Mari Lee, Henry Wang, Ari Evan, and Matthew Cohen – they often do battle with a barrage of cheesy projections (by David Bengali) that baldly telegraph the play’s historical context. Shards of glass suggest Kristallnacht, while the Brooklyn Bridge stands in for New York. An informational crawl imparts historical facts that should be introduced through the drama. Wolf punts, for example, on considering why Toscanini was accepted into New York with open arms at roughly the same moment when the MS St. Louis, containing nearly 1,000 Jewish refugees, was turned away. Beautifully performed music is a delight in and of itself, but in Maestro, it adds little to the drama. Wolf fails to capture the outsized personality of a great conductor or how making music shaped his life. At one point, Toscanini describes himself as a “useless spectator” to history. In this play, that statement unfortunately proves too true.